The mysterious and charismatic Marigold Strother has been visiting three, specific strangers, unbeknownst to each other, for the past three months. When it becomes clear that each relationship can no longer continue, she is forced to decide whether or not to pursue the real reason why she has befriended them: to fulfill her twisted needs. It happened during a long, dark walk, the types of which I have been taking for years. One sees, hears, smells, and senses many things that one might miss if they were whizzing by in a car, bus, or train; anything faster than feet. Or, perhaps, they'd still miss those walking details should they simply be imperceptive, or buried in their phone... like I had been. It was during this long, dark walk that I sifted through Facebook's brand of negativity and stumbled upon an article accounting the experiences of a mother and father who had lost their 19-year old son to a sudden, inexplicable death. If I recall correctly, they were surprised to learn that he had done... something... with himself... for others. I reached the end of the rather blandly-written article, clicked "X," and put it out of my head. Days later, it was the second last night of the Toronto International Film Festival and the final night of the Toronto Independent Film Festival. I had attended nearly a week and a half's worth of films, met and networked with a week and a half's worth of filmmakers, distributors, and anyone associated with the film world, and built up enough frustration-turned-inspiration to embark on a new, creative journey. You see, the combined festivals were chock full of very few gems and all-too-many lumps of coal, and it seemed that filmmakers, programmers, and audiences alike were (willfully?) ignorant of the projected majority mediocrity. Being in the throes of editing the drama Usher, the Usher, I found myself wanting to mentally, emotionally, intellectually, creatively, and physically get away from everything associated with it; not because of anything negative, but to quench what I've come to learn is and have embraced as an unquenchable restlessness: to explore whilst creating, to create whilst exploring. "Family films, comedies, and horror" was the popular answer among producers, distributors, and most filmmakers at both TIFF's. Now, at the risk of sounding vain and egoistical, I saw those so-called "family films, comedies, and horror" official selections and wasn't impressed in the slightest, save for a few shining examples. Even still, it appeared as if even the most forward-thinking filmmakers were afraid of their own explorations, to delve into deeper, darker, and colder terrain; this, of course, applying to "horror." Of course, many reasons attributed to these cinematic results: budgetary constraints; various limitations; personal preferences and inspirations; lack of life experience; and so much more. And, of course, I'm no sage or cinematic James Bond. However, if there was ever a genre I'd explore outside of pure drama, it'd be "horror." There are certain, dare I say, "liberties" that an astute storyteller can take in the world of unpredictability and rawness, both of which, sadly, I hadn't experienced in years, and most definitely not at these festivals. And, so, I went home after the final days of both TIFF's. I went to bed. It's in the darkness that everything becomes clear. Restless, I went for another long, dark walk. Again, there were the familiar sights, sounds, smells, and more. Each sense triggered a personal strong suit: memory. Uncannily, I recalled a specific spot along my journey where I happened to be reading that article about the mother and father who had suddenly, inexplicably lost their 19-year old son. There was no real reason to remember the article, though it was most likely a subconscious manufactured effort to come up with a new story, something that fell along the lines of "horror." Anger has been, is, and always will be my muse, and for many obvious and obscure reasons, most, if not all, of which can be discovered and explored on the page. Hopes, dreams, fears; all of it serves the creative process. And "what to watch?" The relentless question I ask myself each night when browsing, seemingly always for the first time, a personal 1,600+ DVD library. Irreversible was a possible watch. Since first watching - experiencing - it over a decade ago, it has served as my go-to example and comparative piece to any filmmaker or filmgoer who thought they had made or saw something "dark." But I wasn't in the mood to descend into that title's mad, beautiful world. For whatever reason - fate? - The Silence of the Lambs won out. Truthfully, I never really comprehended why the film was so great. Yes, the performances are strong and unique, and the story well-told, but it didn't stand out as something, ultimately, "great." Mind you, it wasn't as if I was making the next The Godfather anytime soon. Watching Hannibal Lecter during each minute of his 16-minute, Academy Award-Winning performance, I was reminded of his presence, on and off camera, his charisma, his cunning, his intelligence, his sophistication, his calculation, his anticipation, his ferocity, his overall style. I began to mentally wade through other examples: Norman Bates of Psycho and Patrick Bateman of American Psycho jumping to mind. Another long, dark walk. Another wave of memories and building inspiration. During these walks. I often considered what I might look like to someone who happened to catch a glimpse of me, to walk or drive by me. Was I, to them, someone good or bad? Were they? What about the houses? Who lived in them? What secrets did they tuck away from the world? From me? What would happen if I walked up to a house, either randomly, or one I had kept an eye on for quite some time during my long, dark walks? But why would I walk up to a house? And there she was! Standing right there! Walking up to a house! Knocking on a door! A man answering! She walks in! She smiles at me before shutting the door behind her! Of course, only I could see her. Only I knew what she was doing in the house, what she was doing - or aiming to do - to that man, and why. 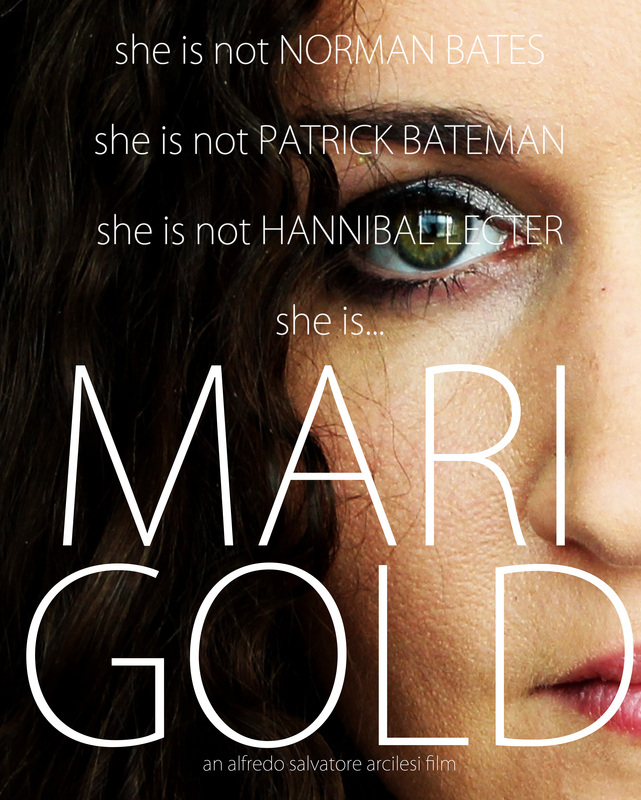 ...she was - is - Marigold. "The narrative offers a very skilled execution of its premise that delays the reveal of Marigold's purpose..."
"...rendered with exhaustive visual detail." "...a lurid tone of revulsion that fully delivers on any expectations of horror fans." "This story is so revolting and awful that audiences will feel queasy and want to take a shower after they are finished experiencing it." "Marigold is so sinister and unmoved in her plan that the narrative has no antagonist. She is pure unstoppable evil." "Marigold is well-written, there is no doubt about that. But, ultimately, it is a sharp execution of a story so horrific and revolting it begs the question of whether or not it should ever be told in the first place."